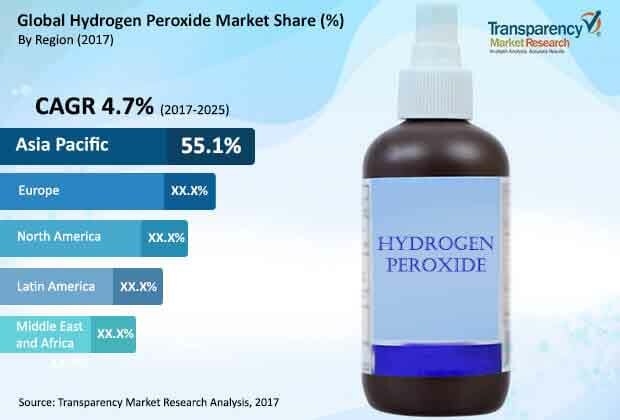 The global market for hydrogen peroxide is anticipated to witness a relentless development direction over the coming years. As per a report by Transparency Market Research (TMR), the market comprises of various major players, which account for major share of the market. The well-known players are estimated to benefit from developing nations and their colossal potential, through extension of their image by means of mergers and acquisitions. Well-settled players are required to enhance their product portfolio by collaborations with the big firms. Among the major noticeable names of the global peroxide market are Solvay S.A., Arkema S.A., National Peroxide Limited, Mitsubishi Gas Chemical Company, and, Evonik Industries AG. The global hydrogen peroxide market was assessed around value of worth US$2.44 bn in the 2016. By end of 2025, the market is estimated to reach around US$3.68 bn, displaying a CAGR of 4.7%. The Asia Pacific region is anticipated to feature a robust CAGR 5.3% within the forecast period from 2017 and 2025, making it the main segment as far as development rate. The key uses of hydrogen peroxide canvassed in the report incorporate utilization crosswise over paper and mash, concoction, squander water treatment, and mining enterprises. Of these, the paper and mash industry represented a significant offer of the global hydrogen peroxide market in 2016. Hydrogen peroxide is broadly utilized as a dying and oxidizing specialist in the paper and mash industry. Regionally, the market in Asia Pacific records for a noteworthy offer as far as utilization and generation of hydrogen peroxide on a global front. The market in the area is driven by rising interest from paper and mash, synthetic, and wastewater treatment businesses. The surge in demand of hydrogen peroxide is increasing as result of advancement in technology. For example, the energy division at Stanford University and SLAC National Accelerator Laboratory have developed a device to deliver hydrogen peroxide. This device can be boosted using non-renewable source of energy, for example, solar panels. The change of such devices will be one of the patterns that will get balance in the hydrogen peroxide market in the future years. Electronic review hydrogen peroxide used with no other substance or coupled with sulphuric acid in the production of semiconductors as a cleaning administrator and oxidizing agent is expected to emphatically influence the market. Advanced research in this field is foreseen to give new development roads over the coming years, which may in like manner capably influence hydrogen peroxide market. Be that as it may, the scope of health issues because of emergence of the combination may hamper the market improvement to some degree. Stringent controls stated by the specialists upon the utilization and hydrogen peroxide center as a key applications including industrial and healthcare applications is estimated to weaken the market growth to some degree. Electronic review hydrogen peroxide used with no other substance or coupled with sulphuric acid in the production of semiconductors as a cleaning administrator and oxidizing agent is expected to emphatically influence the market. Advanced research in this field is foreseen to give new development roads over the coming years, which may in like manner capably influence hydrogen peroxide market.